Whether you've adopted one or several guinea pigs, they'll all enjoy playtime. Fill your guinea pigs' toy box with a combination of store-bought toys and ones you've made at home. You don't need a degree in art to create toys that will keep your cavy contented for hours. Sometimes all it takes is pulling the last square of toilet paper off the roll. Your guinea pig won't insist on high-priced toys with all the bells and whistles. For your little rodent, simpler is better. Empty toilet paper rolls, crumpled wads of paper and even an old sock -- laundered, if you please -- will provide enough entertainment to keep him occupied and out of trouble. Make a homemade toy for your guinea pig by stuffing one item with another. He'll be happy to spend a whole afternoon removing the stuffing and strewing it around. 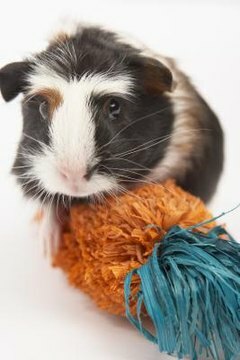 Stuff some shredded paper into a sock or a small box, or pack an empty toilet paper roll tightly with hay to keep your guinea pig busy for hours. Give your guinea pig a few places to hide out and he'll be delighted to explore and take cover over and over. Empty shoe boxes, tissue boxes, paper bags and oatmeal containers are ideal havens for guinea pigs. Cut a hole big enough for your guinea pig to fit through easily, then put some shredded paper in the box or bag. Your guinea pig will be thrilled with his new playhouse and be even more pleased to tear the paper and move it in and out of his hideout. Guinea pigs aren't known for their athletic prowess, but they enjoy a challenging obstacle course or maze now and then. Put one together for your cavy using boxes, sofa cushions and cardboard tubes. Your little guy won't be able to climb or jump over the obstacles, but he should be able to find his way around them. Use your guinea pig's favorite treat to entice him from starting line to finish line. When food is at stake, he'll readily learn the path, and for months will be able to recall the quickest way to the treat. Once your guinea pig has mastered one course, change it up and make it more intricate to for a new challenge.